For centuries, women from the Land of the Rising Sun have been revered for their immaculate & beautiful complexion. Many seek out the secret to their smooth, radiant skin with a youthful appearance regardless of their age. The key to their beautiful appearance lies in the unique Japanese skincare ritual consisting of cosmetics enriched with nature’s best ingredients. That, combined with a detailed daily step by step routine – and most importantly, in the right order, provides skin with multilayer deep hydration that promotes enduring youthfulness. 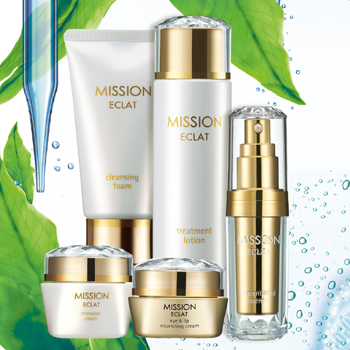 Mission is a line of original Japanese cosmetics - a combination of advanced technology, inspired by the latest discoveries of science and the power of well-known and valued ingredients. It is the real essence of Japanese beauty - rich formulas, full of the best ingredients that harmoniously combine traditional Japanese ritual and effective rejuvenating care…. And it is now yours. The secret of the Japanese daily ritual is the multi-stage moisturizing of the skin and starting care from the lightest and most concentrated formulas and ending with the application of a rich cream that creates an invisible protective barrier on the skin.